Cut tortillas into 2 1/2 in pieces, set aside. In a large frying pan, melt butter, add onion and garlic. Sauté for 2 minutes on low heat. Season the shrimp with chili powder, salt and pepper. Add to the onion and garlic, cook for 5 minutes while stirring. Remove from heat and sprinkle with parsley. You can also use small scallops or chicken strips instead of fish. 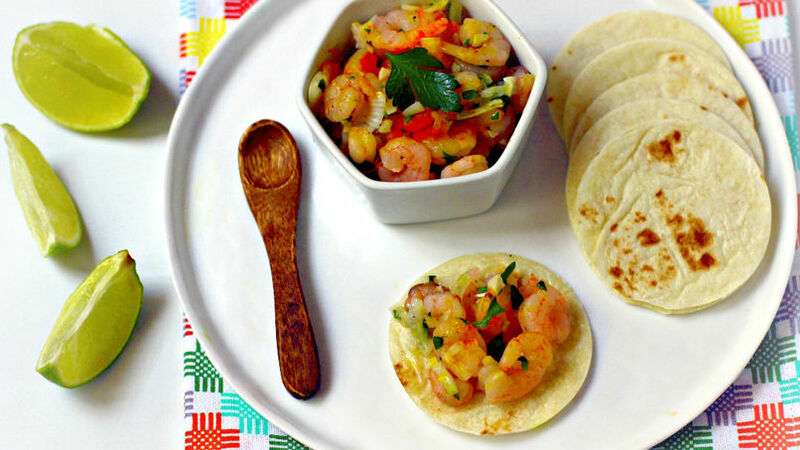 Shrimp tacos are one of my favorite dishes whenever I get together with friends. They're easy to make and don’t require a lot of time in the kitchen. You can use hard or soft tortillas and cut them to the desired size. Make them for your next get-together and enjoy this delicious dish.